Die Martis, Decembris 17, 1644. ORDERED, That the Care of the Western Parts, and of Wilteshire, and the Parts adjacent, and of the Party that is sent thither, be in especial manner recommended unto the Committee of both Kingdoms. Ordered, That it be recommended unto the Committee of both Kingdoms, to consider of putting into Action the Forces that lie near upon the Town, and the associated Counties within the Parliament's Quarters, for the best Advantage of the Publick, and the greatest Ease and Relief of all the neighbouring Counties. Ordered, That Saturday next be peremptorily appointed to take into Consideration the sad Condition of the Counties of Oxon, Bucks, and Berks; and of some way for their Relief. Resolved, &c. That the Committee of Lords and Commons for Advance of Monies, at Haberdashers Hall, do advance Two thousand Pounds, to be paid next after the Assignments now upon that Committee to such as the Committee for the West shall appoint to receive the same, to be disposed of by the said Committee for the Advance of the Service in the West. 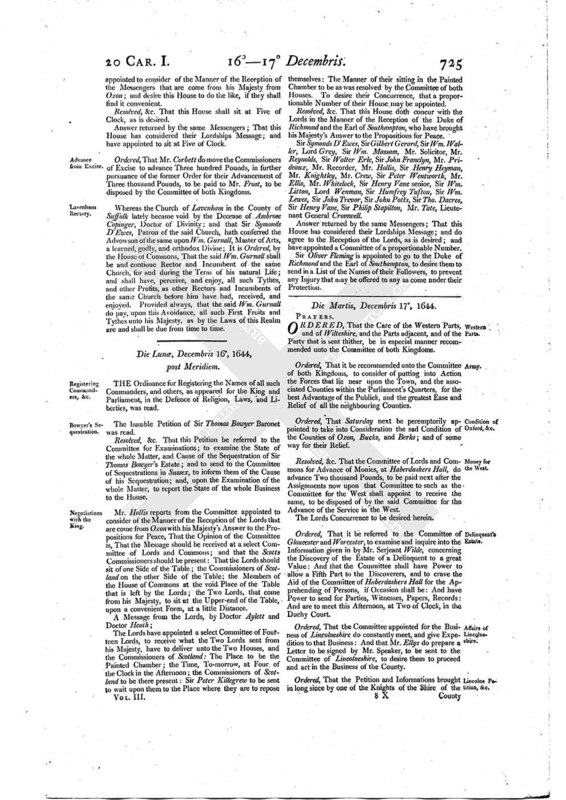 Ordered, That it be referred to the Committee of Gloucester and Worcester, to examine and inquire into the Information given in by Mr. Serjeant Wilde, concerning the Discovery of the Estate of a Delinquent to a great Value: And that the Committee shall have Power to allow a Fifth Part to the Discoverers, and to crave the Aid of the Committee of Haberdashers Hall for the Apprehending of Persons, if Occasion shall be: And have Power to send for Parties, Witnesses, Papers, Records: And are to meet this Afternoon, at Two of Clock, in the Duchy Court. Ordered, That the Committee appointed for the Business of Lincolneshire do constantly meet, and give Expedition to that Business: And that Mr. Ellys do prepare a Letter to be signed by Mr. Speaker, to be sent to the Committee of Lincolneshire, to desire them to proceed and act in the Business of the County. Ordered, That the Petition and Informations brought in long since by one of the Knights of the Shire of the County of Lincolne, in the Name of divers Gentlemen, and other Inhabitants of the said County, be read on Saturday next. According to an Order made on Saturday last the House was resolved into a Committee, to take into further Consideration the Ordinance for disenabling Members of either House to have or execute any Office Military or Civil, &c.
Mr. Ellys called to the Chair. The Lords having received a Petition from Mr. John Gryffyth; and the House of Commons being interested in this Business, it having been under the Examination of Committees of both Houses; the Lords thought not fit to do any thing in it without first consulting with the House of Commons. The Lords formerly received an Ordinance concerning the Duchy Seal of Lancaster; to which they agree, with some Amendments; in which they desire the Concurrence of this House. Ordered, That this Petition from Mr. Gryffyth be read on Saturday next. The Amendments, sent from the Lords, to the Ordinance concerning the Duchy Seal, were read; and, upon the Question, assented unto; and, so amended, ordered to be printed. Answer returned by the same Messengers; That this House has considered their Lordships Message; and do agree to the Amendments concerning the Duchy Seal: And as to the Petition from Mr. John Gryffyth, they will send Answer by Messengers of their own. Mr. Ellys reports from the Grand Committee, the Amendments to the Ordinance for disenabling the Members of either House to have or execute any Office or Command, Military or Civil, during this War, &c. The which were twice read; and, upon the Question, assented unto. Mr. Holles, Sir Philip Stapilton Tellers for the Yea: With the Yea, 93. Sir Hen. Vane junior, Sir Jo. Evelyn junior, Tellers for the Noe: With the Noe, 100. A Proviso was offered to be added to this Ordinance; That no Person should enjoy or execute any Office or Command, Military or Civil, that should not take the National Covenant, and subscribe to submit to such a Church Government as shall be agreed upon by both Houses of Parliament, upon Advice with the Assembly of Divines: The which was read the First Time. Resolved, &c. That the further Debate of this Proviso, and this Ordinance, shall be resumed on Thursday next, the first Business. The Lords, at the Rising of the House, adjourned their House till Five of Clock this Afternoon; and do desire this House to do the like, if they shall find it convenient. Answer returned by the same Messengers; That this House has considered their Lordships Message; and do intend to sit at Five of Clock, as is desired. Mr. Holles reports from the Committee appointed to receive the Answer brought from his Majesty, to the Propositions of both Houses, That, at the first, the Duke of Richmond said something, which was spoken so low, that he could not be heard: Whereupon he was desired to put it in Writing: The which he did accordingly. And it was read by Mr. Holles; and the Answer by the Clerk. We are commanded, by His Majesty, together with His Answer, which we bring, to present to you the Assurance of His real and earnest Desires of Peace; which He conceives cannot so well appear by any Expressions in Words, as by those Proofs his Actions shall make, whensoever it shall be put into a way of Trial; which He much desires may be with all Speed. 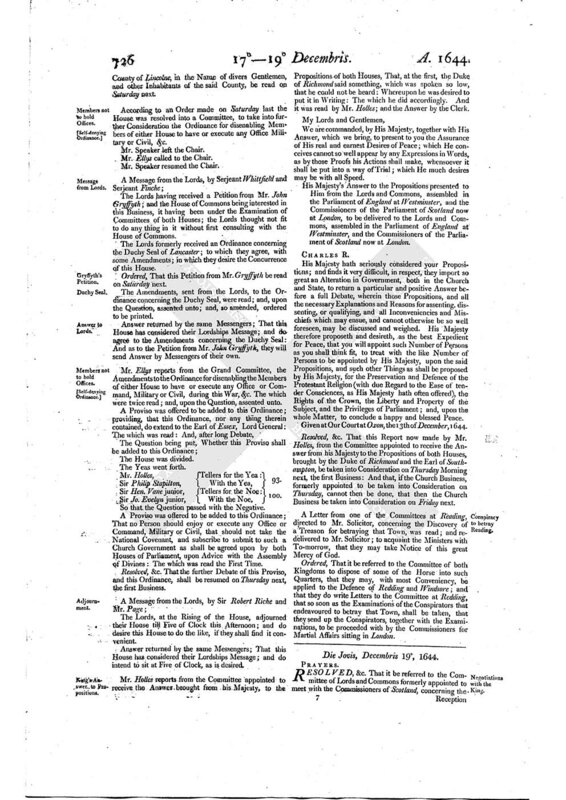 His Majesty's Answer to the Propositions presented to Him from the Lords and Commons, assembled in the Parliament of England at Westminster, and the Commissioners of the Parliament of Scotland now at London, to be delivered to the Lords and Commons, assembled in the Parliament of England at Westminster, and the Commissioners of the Parliament of Scotland now at London. His Majesty hath seriously considered your Propositions; and finds it very difficult, in respect, they import so great an Alteration in Government, both in the Church and State, to return a particular and positive Answer before a full Debate, wherein those Propositions, and all the necessary Explanations and Reasons for assenting, dissenting, or qualifying, and all Inconveniencies and Mischiefs which may ensue, and cannot otherwise be so well foreseen, may be discussed and weighed. His Majesty therefore proposeth and desireth, as the best Expedient for Peace, that you will appoint such Number of Persons as you shall think fit, to treat with the like Number of Persons to be appointed by His Majesty, upon the said Propositions, and such other Things as shall be proposed by His Majesty, for the Preservation and Defence of the Protestant Religion (with due Regard to the Ease of tender Consciences, as His Majesty hath often offered), the Rights of the Crown, the Liberty and Property of the Subject, and the Privileges of Parliament; and, upon the whole Matter, to conclude a happy and blessed Peace. Given at Our Court at Oxon, the 13th of December, 1644. Resolved, &c. That this Report now made by Mr. Holles, from the Committee appointed to receive the Answer from his Majesty to the Propositions of both Houses, brought by the Duke of Richmond and the Earl of Southampton, be taken into Consideration on Thursday Morning next, the first Business: And that, if the Church Business, formerly appointed to be taken into Consideration on Thursday, cannot then be done, that then the Church Business be taken into Consideration on Friday next. A Letter from one of the Committees at Reading, directed to Mr. Solicitor, concerning the Discovery of a Treason for betraying that Town, was read; and redelivered to Mr. Solicitor; to acquaint the Ministers with To-morrow, that they may take Notice of this great Mercy of God. Ordered, That it be referred to the Committee of both Kingdoms to dispose of some of the Horse into such Quarters, that they may, with most Conveniency, be applied to the Defence of Redding and Windsore; and that they do write Letters to the Committee at Redding, that so soon as the Examinations of the Conspirators that endeavoured to betray that Town, shall be taken, that they send up the Conspirators, together with the Examinations, to be proceeded with by the Commissioners for Martial Affairs sitting in London.